Blacknall signed a future/reserve contract with the Raiders on Tuesday. Analysis: Blacknall joined the Raiders' practice squad at the end of November and will have an opportunity to remain with the team throughout the offseason. Blacknall signed with the Raiders' practice squad Tuesday, Michael Gehlken of the Las Vegas Review-Journal reports. Analysis: Blacknall was recently waived by the waivers but has landed back on the team's practice squad. Coach Jon Gurden indicated he is, "a guy that has a big upside and he just needs some time." The undrafted rookie will look to continue making an impression. Blacknall was waived by the Raiders on Monday, Michael Gehlken of the Las Vegas Review-Journal reports. Analysis: Blacknall spent less than a week on Oakland's active roster. The undrafted rookie out of Penn State will be a strong candidate to re-sign with the Raiders' practice squad if he goes unclaimed on waivers. The Raiders signed Blacknall off their practice squad Wednesday, Matt Schneidman of The San Jose Mercury News reports. Analysis: Blacknall has been called up to Oakland's 53-man roster following the news that Martavis Bryant (knee) is expected to miss multiple games due to a PCL injury. The undrafted rookie out of Penn State has a chance to make his NFL debut against the Cardinals in Week 11, and will likely play most of his snaps on special teams. 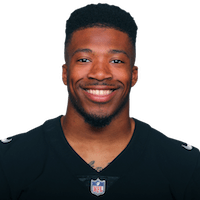 Blacknall was waived by the Raiders on Saturday and signed with the team's practice squad Sunday, Jerry McDonald of the Oakland Tribune reports. Analysis: Blacknall went undrafted out of Penn State after hauling in 17 passes for 289 yards and two scores in 2017. He'll look to showcase potential as a member of the Raiders' practice squad this season. There are no videos available for Saeed Blacknall. Click here to view all videos.